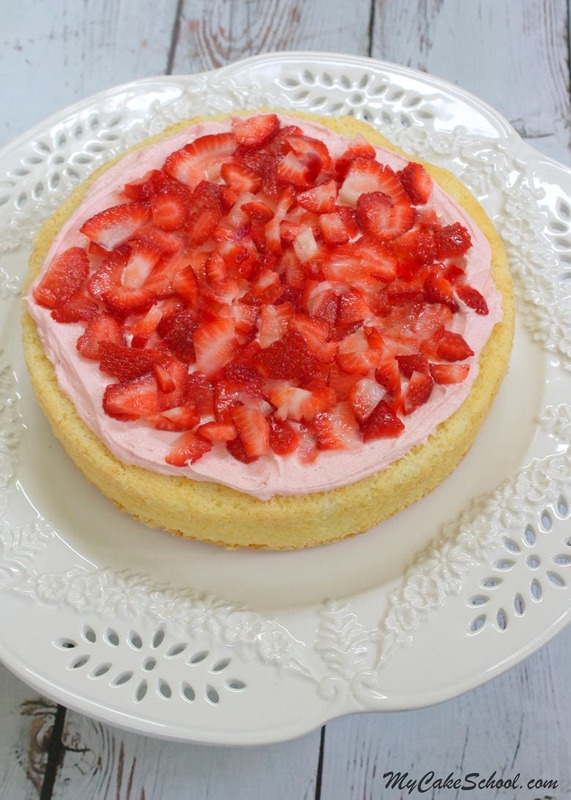 Today I’m going to share an amazing scratch Strawberry Lemon Cake with you! This perfect summertime dessert brings together two favorites of mine: moist, delicious, lemon cake layers and a sweet Strawberry Buttercream! 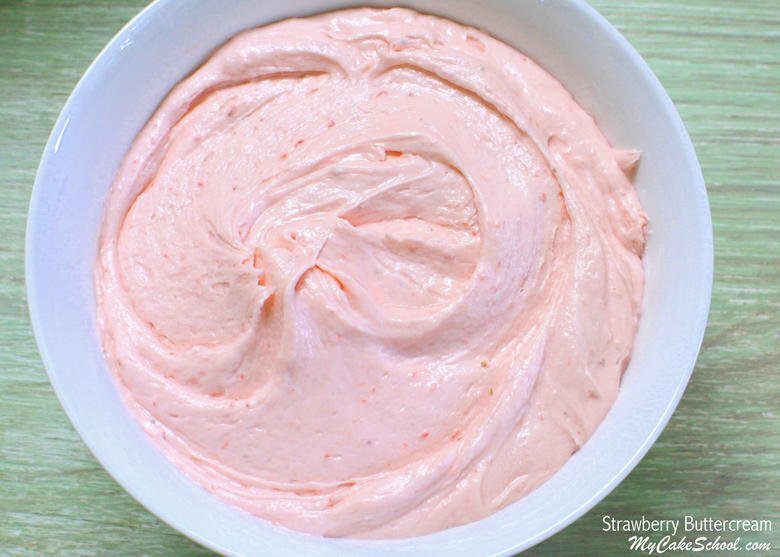 Throw in some freshly sliced strawberries and you have an instant classic! 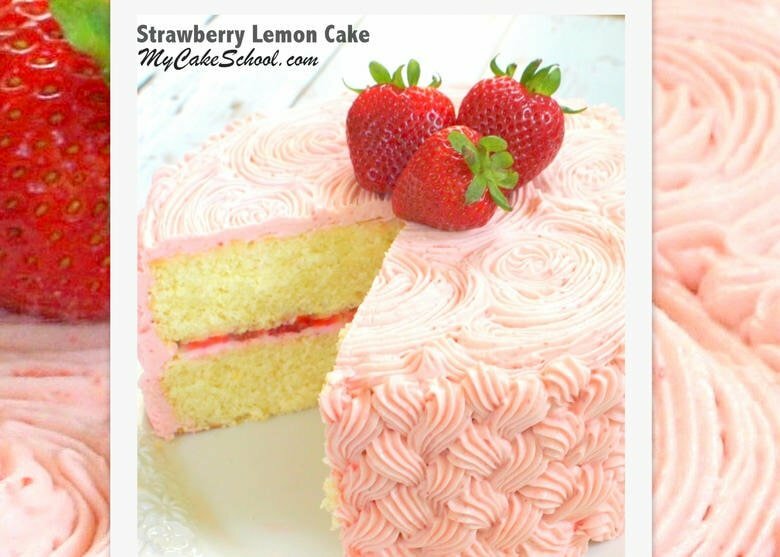 For our Strawberry Lemon Cake, we’re using our popular scratch Lemon Cake from our Recipes section which you can find here: Scratch Lemon Cake Recipe. We’ve tried other lemon cake recipes but we always come back to this one. It is super moist, easy to make, and has just the right amount of lemon. If you haven’t tried it yet, you must! As much as we love our tried and true combination of lemon cake with lemon curd and lemon cream cheese frosting, it’s fun to experiment with something new. There are SO many flavors that work well with lemon. Strawberry is one of them! This Strawberry Lemon Cake has the perfect balance of lemon and strawberry flavors, between the lemon cake, strawberry frosting, and strawberry slices. You are going to love it! After placing the first Lemon Cake layer on our pedestal, I slathered it with a layer of Strawberry Buttercream. This buttercream recipe has it all. The strawberry flavor is fabulous, it works well as both a filling and frosting, and pipes beautifully! 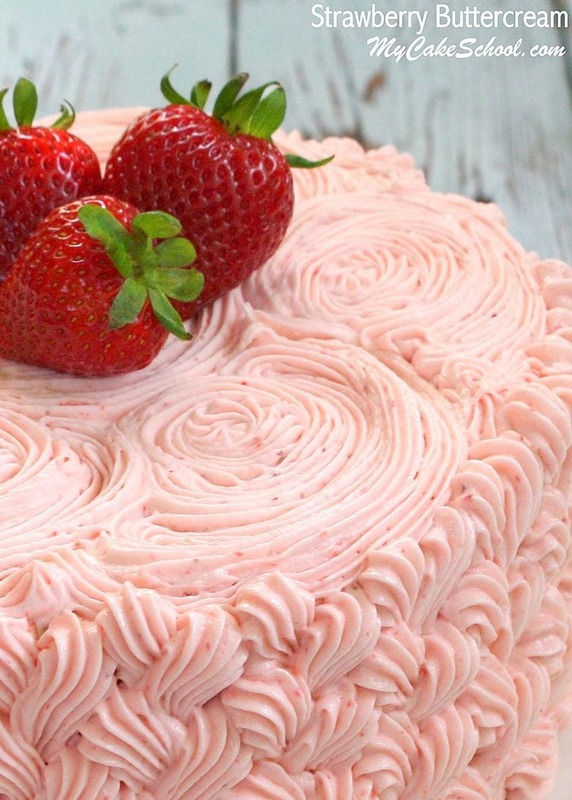 With it being strawberry season, we couldn’t resist spreading a generous helping of sliced strawberries on top of the strawberry buttercream filling. Slice as many strawberries as you’d like, but keep your slices far enough from the edge of the cake to ensure that they will not spill out when the cake is stacked. 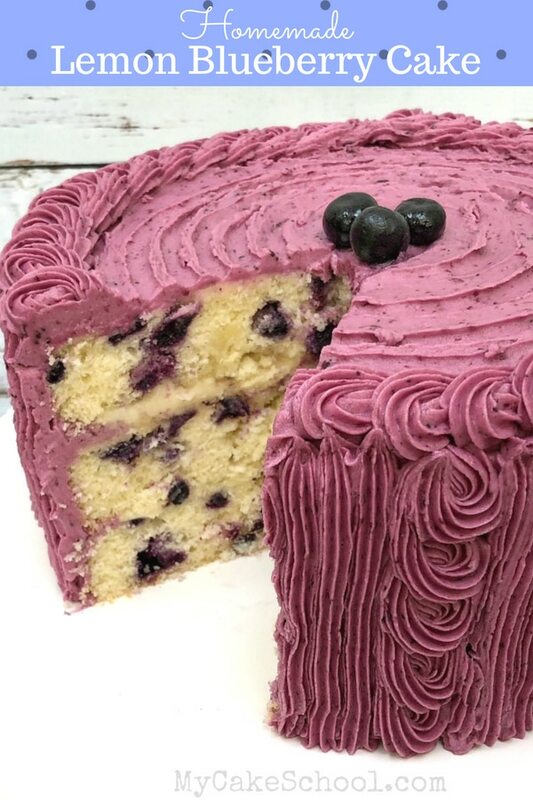 You can pipe a dam of buttercream just inside the edge of the cake if you’d like so that none of this delicious filling escapes. 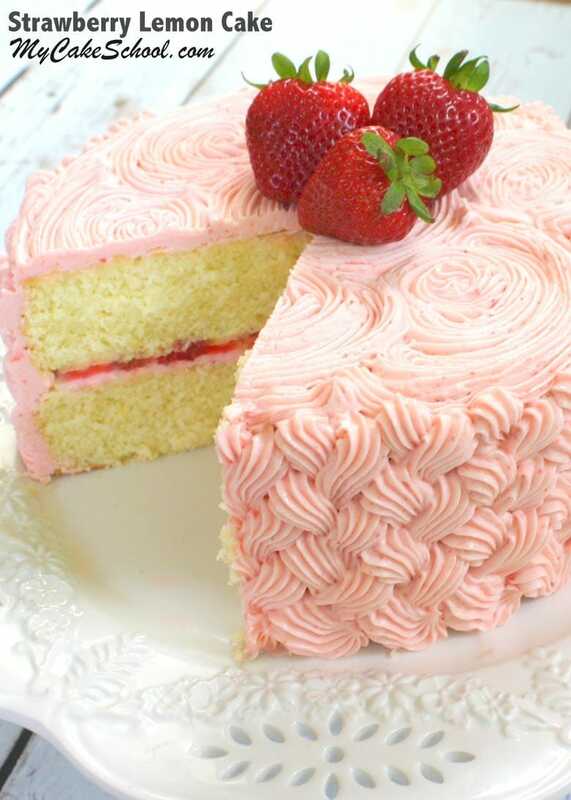 Here’s a closer look at our homemade Strawberry Buttercream! It is packed with strawberry flavor without being overly sweet. If you love strawberries, this is going to become a new favorite of yours. Strawberry Perfection! After adding our strawberry filling and strawberry slices, I added our second layer of lemon cake and frosted the cake with a thin crumb coat of strawberry buttercream, followed by a layer of decorative piping. I piped buttercream spirals all over the top of the cake using a Wilton 21 star tip, and continued around the sides with a braided buttercream effect. Decorate however you’d like! We topped the cake with a few beautiful strawberries for an extra pop of color. That’s all there is to it! We hope that you give this cake recipe a try soon! It is SO good, and the lemon and strawberry flavor combination is one that you don’t see too often. It’s fun to change things up now and then, and we think that you’re going to LOVE this flavor pairing for summer! I love the braided effect on the side. Can you tell me how to do it? Is there a tutorial? Just discovered your site and love it! I’m on instagram @tortamore.